L&G have gained the 816 from Central Taxi's which operates St Wilfrids - Jarrow, and the 819 St Josephs - Leam Lane(?). (04/09/2018, 19:31)pbjd Wrote: L&G have gained the 816 from Central Taxi's which operates St Wilfrids - Jarrow, and the 819 St Josephs - Leam Lane(?). L&G have the afternoon 816 which then goes on to the afternoon 808. Afternoon 815 which then goes on to the afternoon 558. L&G do not have the 819 that is with Go North East. Although NIS, saw them working a blue W reg President type decker. Guessing it was the St Wilfs service. (20/09/2018, 10:28)Andreos1 Wrote: Although NIS, saw them working a blue W reg President type decker. The W-reg President bodied Trident you mention is on loan from Kingsley's Coaches - it does the 815 scholars service from St Josephs in Hebburn every day at 15:05. 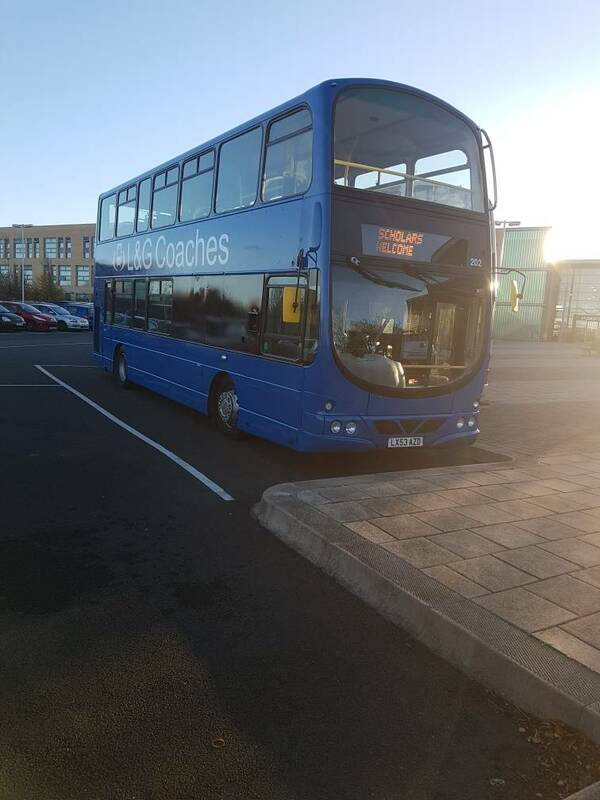 (20/09/2018, 11:19)Dan Wrote: The W-reg President bodied Trident you mention is on loan from Kingsley's Coaches - it does the 815 scholars service from St Josephs in Hebburn every day at 15:05.
number 808 effective from 08 October 2018. Nexus requested the removal of this service due to low use. The owner of L&G Coaches was happy to hand this one back in as there was a lot of cost in mileage associated with this service. The blue double-decks originally suggested to be on loan from Kingsleys Coaches were actually bought outright (the owner of L&G Coaches previously being a driver at Kingsleys). The Gemini is planned to undergo refurbishment at Thorntons when another double-deck is acquired by the company. (20/10/2018, 12:47)Dan Wrote: Nexus requested the removal of this service due to low use. Where is L&G Coaches based at do you know? With Kingsleys allergely not operating anymore and with the owner being an ex Kingsleys driver, I would imagine the vehicles will be stored and maintained there? Will be interesting if there is going to be much in the way of ambition of getting onto the proper bus market or will it be just Scholars and minor contracts only? (02/11/2018, 00:54)Bus_User Wrote: Where is L&G Coaches based at do you know? With Kingsleys allergely not operating anymore and with the owner being an ex Kingsleys driver, I would imagine the vehicles will be stored and maintained there? L&G Coaches have now registered Kingsleys Coaches as their operating centre as a relocation from the previous base at Port of Tyne in Tyne Dock. I don't think the owner has any massive aspirations beyond scholars work, from what he's told me, and is happy with "no more than five" at the moment, but will be interesting to see what comes out in the wash in next year's tenders. There's often swimming bath trips etc available for his buses to do during the day too. As GPR has mentioned above, they're currently based in Tyne Dock. (09/11/2018, 13:38)GuyParkRoyal Wrote: L&G Coaches have now registered Kingsleys Coaches as their operating centre as a relocation from the previous base at Port of Tyne in Tyne Dock. L&G Coaches are still going to use Tyne Dock as their main base - using the Kingsley's yard as a place for maintenance and to store additional buses at (any temporary loanees such as coaches for weekend excursions etc). Apparently A-Line were possibly looking to re-locate to L&G Coaches' current yard in Tyne Dock but it's been knocked on the head as L&G Coaches still need it. They've also acquired two further double-decks from Kingsley's - one is white in case that narrows down the vehicle identity - and I think both of these are going to remain in storage at Kingsley's. The blue double-decks at Tyne Dock are due to have the company logos added in vinyl tomorrow. (09/11/2018, 20:02)Dan Wrote: L&G Coaches are still going to use Tyne Dock as their main base - using the Kingsley's yard as a place for maintenance and to store additional buses at (any temporary loanees such as coaches for weekend excursions etc). Apparently A-Line were possibly looking to re-locate to L&G Coaches' current yard in Tyne Dock but it's been knocked on the head as L&G Coaches still need it. Gemini with vinyls on as mentioned previously.